He's just welcomed another son, Theo, into his life with second wife Emily. But doting dad Peter Andre proved he doesn't play favourites when he took his children from his past marriage to Katie Price for a Chrismassy day out on Wednesday. The Flava singer, 43, took Junior, 11, and Princess, nine, to watch Disney On Ice presents Frozen at London's O2 Arena, where they met Mickey Mouse himself. It was the opening night of the show and various other celebrities were in attendance. 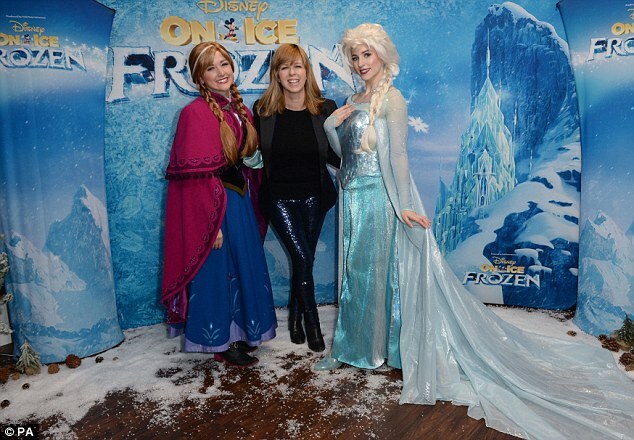 Denise Van Outen and daughter Betsy were there, and met characters Anna and Elsa from the hit movie-turned-ice spectacle. Imogen Thomas also popped by with her girls, Siera and Ariana, who also met and posed with the Disney heroines. Luisa Zissman, Katie Piper, Marvin Humes and Kate Garraway were also there - but despite each of them having children they appeared to be flying solo. Meanwhile, Peter couldn't resist getting a photo with Mickey by himself, grinning at the camera in his fur lined winter coat, stood back-to-back with the famous mouse. The day out with Princess and Junior comes just days after his ex-wife, and the kids' mother, Katie Price was caught on camera drunkenly giving a speech about her eldest child Harvey and her ex-lover Dane Bowers. According to onlookers, it seemed to have been a few party tipples that provoked Katie's rambling speech at a Christmas party she had been hired to attend, earlier this week. Harvey, 14, is the son of Katie's ex-boyfriend Dwight Yorke and he suffers from rare condition Prader-Willi syndrome, and also has ADHD and autism. The mother-of-five was reportedly paid £13,000 to host the EnergySave Christmas party on Monday, and Katie was also accused of embarrassing herself by stripping in the toilets that same night. A second video shows the worse for wear 38-year-old can be seen stumbling around before lifting her dress up to reveal her bare breasts. Back on her best behaviour on Wednesday, Katie vowed to quit drinking for a year after the incident when she appeared on ITV's Loose Women - on which she is a regular panelist.